Benson, 1966, pl. 23, fig. 15. Right lateral view. Slide VS-R-60a, 3-5cm. Bar is 100 µm. 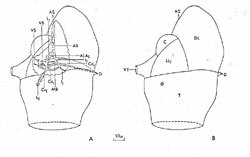 Benson, 1966, text-fig. 22. 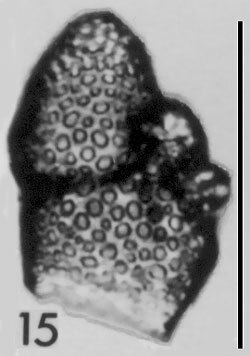 Acrobotrissa cribosa Popofsky (specimen location, VS-R-60b, 3-5 cm; R20/l). Text-fig. 22A. 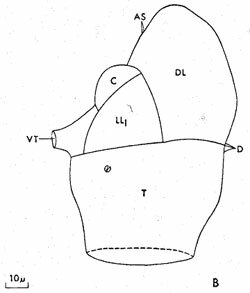 Diagram illustrating the internal structure; all symbols as in figs. 7 and 8. Text-fig. 22B. 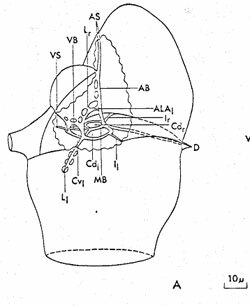 Diagram illustrating the lobes associated with the cephalis; C, cephalis; VT, ventral tube; LLl left lateral lobe; DL, dorsal lobe; T, thorax. 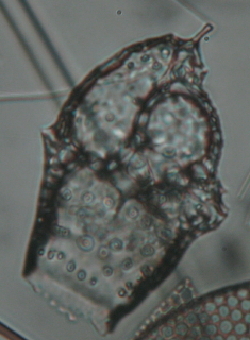 Late Miocene; Acrosphaera australis Zone.